Watch this space for (hopefully) useful advice on dealing with common medical conditions, and possibly some opinion pieces on pertinent clinical topics of the day. Of course if you are unwell and unsure of this advice in anyway, or if you do not fit into the category of patient described under each subject heading it is important that you give us a call and ask for tailored advice. December 16th, 2010 by Dr Wheeler. I have no idea who Mr Hammond is (if that is his real name.) He is a random poster on the BBC news site who has expressed a view which I fear is probably quite widespread at the moment. When you are given medical advice you want it to be authoritative. You want it to be based on good evidence… and most importantly you want the advice to cause you more good than harm. This is all very reasonable – but the recent aspirin debacle brings into sharp focus the fact that unfortunately doctors often operate on a level where there is constant uncertainty as to best practice. The BBC article on the recent research in ‘The Lancet’ (read it here). Is a good precis of the new information available on aspirin therapy. In a nutshell, it states that taking aspirin will in the long run reduce deaths in individuals through a combination of vascular disease prevention and reduced cancer risk. This contradicts other advice that has been coming out over the past 2 years regarding the use of aspirin in healthy individuals because of the risk of gastrointestinal bleeding which has been guiding my practice over the past 6 months or so. The reasons are mainly related to the technical details of how hard it is to do gold standard medical research – a subject of interest to me, but possibly not to the majority of patients who just want to be well. There is no simple way to resolve the issue – we just all need to accept that what we think is good for you today might be thought to be bad for you tomorrow… and muddle through as best as we can. So should you take aspirin? In a nutshell the figures as far as I can tell are this…. taking an aspirin a day from the age of 50 onwards… for at least 5 years – but potentially until you are 75… could reduce your risk of dying from cancer by 25% in the short term, 20% over the long term. Not related to this new study – the latest data would suggest a possible reduction in heart attacks by 20% in addition to the cancer risk improvement. The old idea that it would also reduce your stroke risk is now no longer thought to be true. The downside is an increase in risk of bleeding from your guts…. which can be fatal. The figures from the BBC are that it doubles your risk from 1 in a 1000 to 2 in a thousand. In fact my reading of the data is that in fact the figures are 0.7 in a thousand and 1 in a thousand respectively – so not quite as bad. Beware though… ask me next week and I might have a different answer… and remember the old chinese proverb quoted above next time you get contradictory advice about your medication. May 3rd, 2010 by Dr Wheeler. The purpose of this post isn’t to support any one political viewpoint over another. All of the main parties have aspects of their health policy which to me seem problematic. I do get irritated when information regarding health is misrepresented however – especially when facts and figures are bandied around with little understanding. The first leaders debate was particularly egregious in this regard – with David Cameron either failing to understand or wilfully misrepresenting information that is highly emotive. Almost as bad – the other leaders failed to grasp the problems with what he was saying, either suggesting that they agreed with his ideas or (more likely) they are unable to grasp the concepts involved. The subtext to this is the often repeated idea that the UK is a dreadful country to get cancer in. Compared to just about anywhere else in Europe your number is up before your time… despite our hugely expensive NHS. This statement might be true… but there is a good chance that it is a load of rubbish. All of these comparative figures come from ‘EUROCARE‘ studies – which unfortunately are highly suspect. The UK has a very comprehensive cancer registry and nationwide reporting systems. France only records cancer diagnoses for about 10%-15% of its population… Germany on the other hand has figures for 1% (yes that’s right – 1%) Comparing our comprehensive data with countries that have wildly different levels of coverage and recording is of limited use as you can imagine. In fact there is a lot of evidence that the UK does things very well in cancer diagnosis and treatment, but until the reporting systems in Europe are standardised we can never really know for sure. (There are steps to redress these problems in future EUROCARE reports I believe.) It is of course politically expedient to try and scare the public rather than accept nuances in the data however….. Which leads on to the next point. 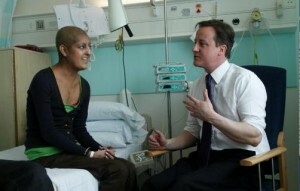 Mr Cameron raised the issue of cancer drugs approved for use in the NHS. In particular ‘Sutent’ an oral drug licensed for use in advanced kidney cancer. Conservative policy is to create a £200 million cancer drug fund to pay for cancer drugs which aren’t currently available in the NHS. In the debate he said that “I have a man in my constituency … who had kidney cancer who came to see me with seven others. Tragically, two of them have died because they couldn’t get the drug Sutent that they wanted..”. This sounds tragic and scary at first glance… but it doesn’t take a lot of thought to realise that there is a major problem with the statement in a logical sense. The idea that if these two unfortunate souls were given sutent they would live long and happy lives is simply not credible. For an excellent and easy to understand explanation of what taking drugs like this can achieve I urge you to read this excellent post on the subject from the ‘Understanding uncertainty’ web site. In a nutshell the author highlights the fact that no drugs work for all people, and that it is impossible to predict an individuals exact outcome from a treatment with any certainty. This is because drug trials deal with populations (the larger the better) – meaning that the data we base decisions on relates to populations in general – not individuals. With some interesting maths (albeit maths which needs to make a number of assumptions for it to be valid) it can be calculated that taking Sutent would have given each of those two patients just a 58% chance of living longer than if they didn’t have it. Even if they were responders however it is impossible to say what benefit they would have gained… or what quality of extra life they would have enjoyed. The bottom line is that a lot of the incredibly expensive cancer drugs that have hit the headlines over the past few years a) have been approved by NICE (the National Institute of Clinical Excellence) anyway (Sutent for example HAS been approved for the NHS – but only for patients where trial evidence has been supplied demonstrating efficacy), b) have minimal effects on prognosis – often at best giving some patients a few extra months of life, and c) are (in my view) horribly and cynically overpriced by the drug companies involved. In a world where we had unlimited resources then of course giving drugs to cancer patients that may extend their life by a few months is worthwhile… but in the real world, the 200 million pounds earmarked for the Conservative drug fund must (by definition) be 200 million that isn’t spent on other things. Other things that could potentially make huge differences to the health of millions of people rather than providing marginal benefits to a few thousand. The real story here is that the drug companies are somehow flying under the radar. It is a scandal when a health board won’t approve an experimental cancer drug for a patient that hasn’t been assessed by NICE, but on the other hand it seems to be perfectly acceptable for drug company’s to charge tens of thousands of pounds for a few tablets? The average yearly cost of taking Sutent in the UK (after a recent deal that meant the first course of treatment is given free) is £24,168. Why does it cost so much? Research and development costs have to be recouped… advertising… share holders profits. Maybe the company that makes it is struggling financially? In fact Pfizer (the drug company involved) in just the last 3 months of 2009 (the most recent figures I can find) made £481 million in profit. Worldwide revenues for Pfizer are said to be $16.5 billion! They (along with the other companies) will no doubt be rubbing their hands in glee that politicians will be helping push forward cancer drugs based on the number of votes available rather than analysis by experts who take cost effectiveness into account. Where better for that £200 million to go than into the big pharmaceutical companies coffers after all? February 1st, 2010 by Practice Nurse. A travel clinic is provided by the Practice. If you are planning a trip abroad please make sure you contact us in good time – a minimum of 6 weeks before you intend to travel ( 8 weeks where possible) so that we can collect enough information to get you adequate immunisation cover before you go. Some immunisations require more than one dose with a specified time gap in between. Please note we do not stock all travel vaccines at the surgery – some can take up to 2 weeks to arrive. You will be asked to complete a travel form (download it here) before discussing your travel needs with myself and the practice doctor if required. We are now a Yellow Fever Vaccination Centre. If you intend to travel to a destination where this vaccination is required it needs to be given at least 10 days before departure. The Fit for Travel website provides travel health information in a country by country guide for the public. It can be accessed at www.fitfortravel.nhs.uk. August 12th, 2009 by Dr Pilkington. This is a really important topic, particularly for the under 25s. Some of you may be aware that chlamydia is now the commonest sexually-transmitted disease in the country, particularly in the younger age groups. It is a particularly sneaky infection, as most people who have it don’t have any symptoms at all, but can go on to develop lasting damage, possibly even infertility – this is why we offer testing for chlamydia for anyone who is at risk, even those who have no symptoms. We would encourage anybody who feels that they may be at risk of chlamydia to make an appointment with any of the doctors or with Angie the Practice Nurse (or phone us to discuss what is involved) – it is really very easy and well worth checking! Half million deaths from flu! July 21st, 2009 by Dr Wheeler. Scary isn’t it? Everywhere you look there are tales about killer flu. Get your Tamiflu now! It’s your only hope! We’re doomed! Some of the journalism I have seen on the subject has been truly horrific, even from reputable sources such as the BBC – though perhaps the media shouldn’t be singled out for our opprobrium when the government can be seen to be egging them on at every opportunity! One headline you probably haven’t seen is the ‘half a million deaths’ one posted above… but it’s actually true. Not in respect of swine flu of course… but plain old seasonal flu that comes round every winter and kills off thousands of old people in the UK annually. The figures from the Centre for Disease Prevention and Control in the USA state that probably 250,000-500,000 people die from the flu every year around the world. By contrast the figure for worldwide confirmed swine flu deaths from the start of the outbreak is…. wait for it… 700! (Source.) Not quite so scary when taken in context is it? But Swine flu is much more dangerous isn’t it? Well…. that might turn out to be true – but not based on what we know so far. The rate of deaths per confirmed case serious enough to need medical attention is currently estimated to be about 0.5% – very similar to the case fatality rate of seasonal flu as reported (here.) Don’t take this to mean that there will be 1 death for every 200 people with swine flu however… there would be many thousands of cases of mild infection that wouldn’t even be reported to medical services and so wouldn’t be included in the figures. The actual death rate will in reality be much lower than 0.5%. So it might not be that dangerous… and if we do get it Tamiflu will save us anyway wont it? Erm… no. This is the most shocking aspect of this whole mess in my opinion. Tamiflu has been around since 1999. But up till now has not exactly covered itself in glory. The limited research that exists suggests that it’s effect on flu is to reduce its duration by three quarters of a day to one full day at best. It may reduce the chance of developing pneumonia in flu patients… but it has never been established exactly how good it would be at preventing death in affected individuals. Figures (based on incomplete evidence) suggest that you would need to treat 1800-3200 patients to save just one life – though some doctors think you would have to treat many many more times those numbers to do so. As is so often the case in medicine we just don’t have all the facts…. but my gut feeling (for what it’s worth) is that Tamiflu probably isn’t all that much use. An interesting debate is linked here – though it isn’t geared towards the layperson you may find it interesting. That’s not to say that Tamiflu doesn’t have a role. In vulnerable patients it might just make the difference between life and death… but that’s not how it is being used under current UK policy. But are there any downsides to using it? Well there are some side effects – nausea and vomiting being the most common, and some people wonder if there may be serious psychiatric reactions in a very few cases (link.) Of more concern is the fact that widespread use of this drug (which is after all the best antiviral we have got) will most probably lead to widespread anti-viral resistance within a short period of time. Basically – if you give it to a whole load of people with mild symptoms who would have got better anyway… by the time someone really sick comes along they might not have much of a chance because the drug has started to become useless! So – what should you do? Well – you could start with this video… quite a nice FAQ from the BBC website that goes through the basics. You could use the online symptom checker at NHS direct or phone NHS 24 on 08454242424. Both of these routes can help tell you if you are in one of the at risk groups who needs to consider using Tamiflu / seeing a doctor for your symptoms – or if you could just deal with it yourself with paracetamol and fluids like a normal cold. Unfortunately people will die from this virus – just as people die from viruses every year. Some of them will be children, and some will be healthy adults who you would have expected to pull through. Tamiflu isn’t going to change that basic fact – and telling the public that it is some sort of wonder drug that will somehow make you safe from harm is disingenuous to say the least. The best thing to have by your side heading into a pandemic situation is a fair bit of luck. Luck in not catching it, or luck in having a mild illness when you do. The next best thing would be to have good life support if you became seriously unwell – so the intensive care departments in big city hospitals will be an important factor in saving lives for the worst affected amongst us. Tamiflu has its place as well, but some common sense is needed in analysing exactly what it can do for us – both as an individual and as a society. Thankfully however. the odds are in our favour…. the vast majority of people who catch swine flu will be unwell for a few days and then get on with the rest of their lives. We don’t need to live in fear of this bug, despite of what the newspapers say!